View of the Pismo Beach Bluffs and what remains of the circular staircase that descended from the Shorecliff Best Western. The staircase was damaged several years ago and was abandoned. Matted and framed to 16 x 24. One of those beautiful evenings in Morro Bay. I'm grateful to be able to walk along the bluffs in Shell Beach and capture moments like this. Matted and framed 16 x 24. Located between Shell Beach and Avila , this is one of my favorite local coastline views. 16 x 20 matted and framed. 16 x 20 matted and framed. Finding a vantage point that shows the gazebo in siloquette. This is a dramatic setting for any wedding. 12 x 16 matted and framed. Located on the back of Morro Bay, this is a peaceful and serene spot. 12 x 16 matted and framed. Selected for the Brushstrokes 2014 Show at the San Luis Obispo Museum of Art! Pismo Beach, Looking North from the bottom of Grand Ave., towards the Pismo Pier, Shell Beach and Avila. 18 x 24 matted and framed. 16 x 20 matted and framed. The sunlight filtered by the clouds create a beam of gold on the ocean surface. 12 x 16 mated and framed. 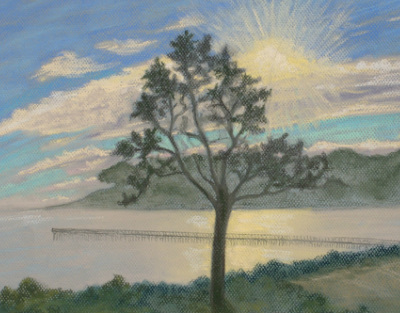 Taken from the Avila Bay Inn, Looking across the bridge. Incredible view of San Luis Port and the coastline between Shell Beach and Avila.. Presented in a matless frame technique that allows the painting to go all the way to the edge of the frame.12 x 16 is size of the image. Matted and framed to 12x 16. this is the view from the boardwalk that begins at the bottom of Grand Avenue looking north. Located in Cambria this little stretch of the coast receives wind and waves that produce driftwood and other treasures from the sea. 16 x 20 matted and framed . Located in Montana de Oro State Park. 16 x 20 matted and framed. View from the path near the Cliff's Resort, a popular surf spot. 16 x 20 matted and framed. this is the location that Hearst had boats bring in treasures from all over the world for his castle on the hill. Also at this location is a small general store and the San Simeon School House. 11 x 14 matted and framed. View of the Pismo and Shell Beach Bluffs with Avila in the distance; mated and framed 18 x 24.